The archaeological site of le Piage is at the base of this cliff. 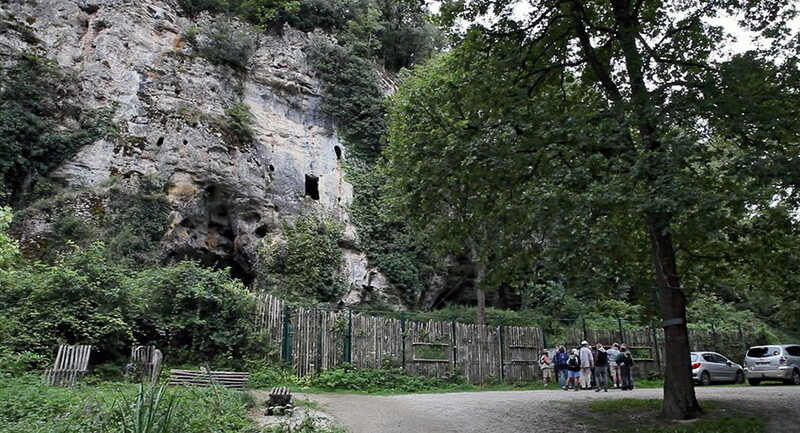 Located just 8 kilometres from the Dordogne valley, just north of Gourdon, the Piage deposit is part of a set of caves and shelters opening at the base of an imposing cliff of Coniacian (Late Cretaceous) limestone. Recognised early in the twentieth century, and scientifically excavated between 1958 and 1968 by Fernand Champagne and René Espitalié, the site documents a fundamental archaeological sequence regarding the early Upper Paleolithic, the period when the Neanderthals are replaced in Western Europe by anatomically modern humans. One of the richest collections in the world of ancient Aurignacian has been excavated there. 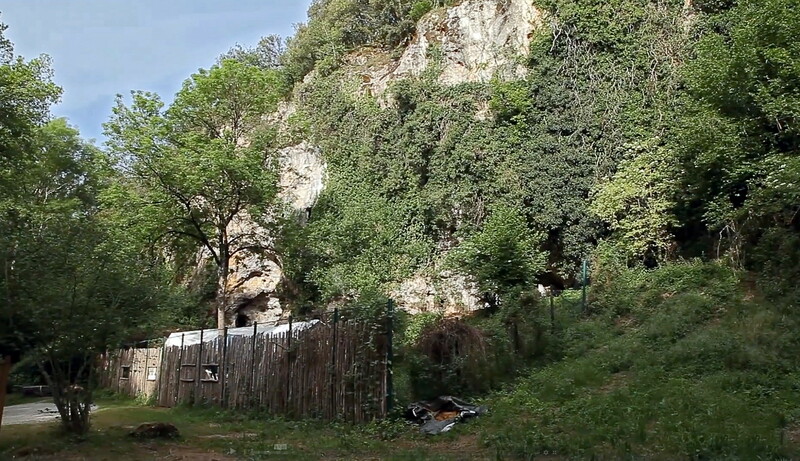 The northern part of the site was found to be interbedded between archaeological levels attributed to the last Neanderthals (Chatelperronian) on the one hand, to the oldest anatomically modern men on the other. This rare stratigraphic configuration was interpreted as the most convincing proof of the contemporaneity of the two populations in Western Europe, thus leaving open the possibility of their meeting. 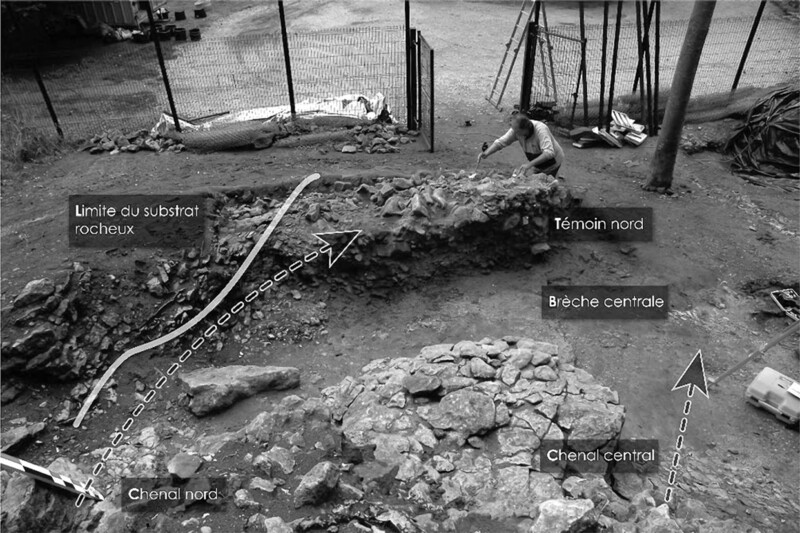 However, since 2004, new excavations conducted by Jean-Guillaume Bordes (University Bordeaux) and Foni le Brun-Ricalens (National Museum of History and Art of Luxembourg). 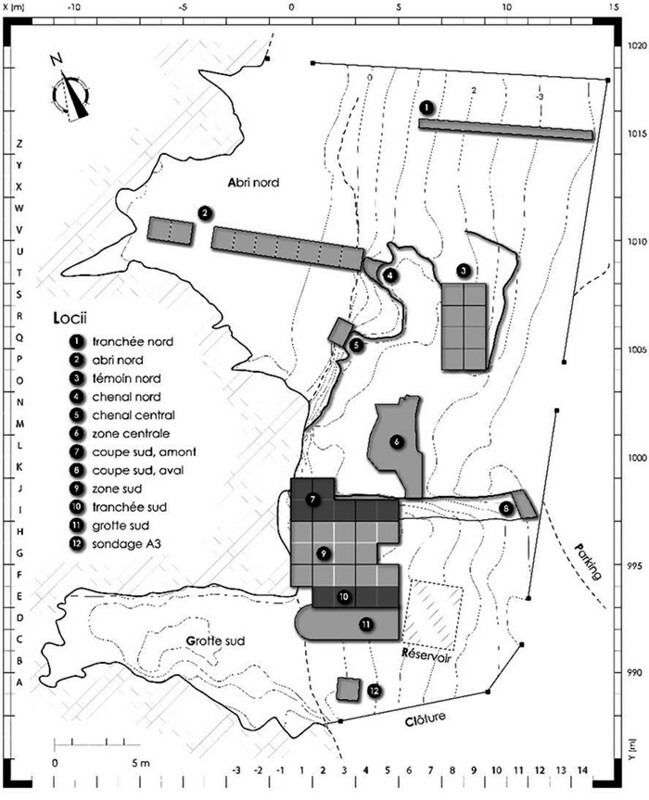 made it possible to demonstrate that this inter-stratification was not a reflection of the history of the site, but the consequence of landslides, and thus of initially distinct layer mixtures. 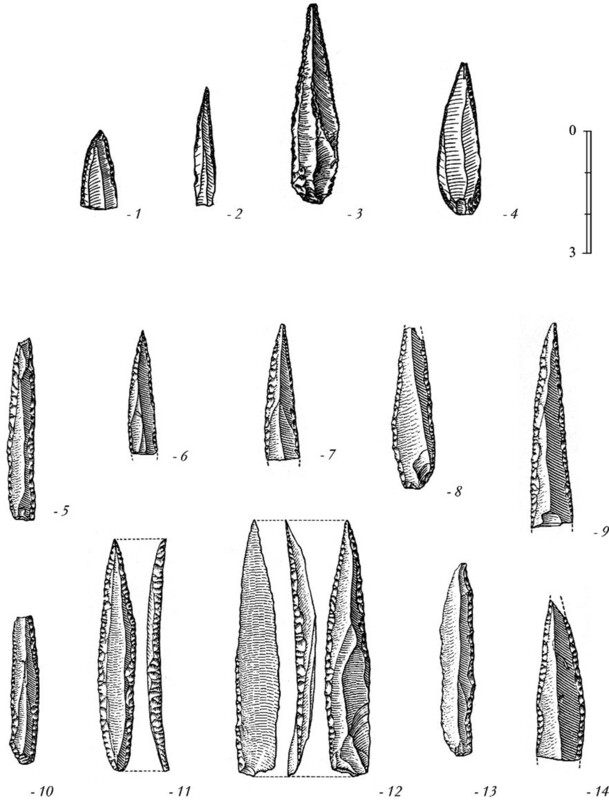 Tools from le Piage layer K.
Grattoirs on the left and right, with a nosed grattoir with a burin on the other end in the centre of the image. 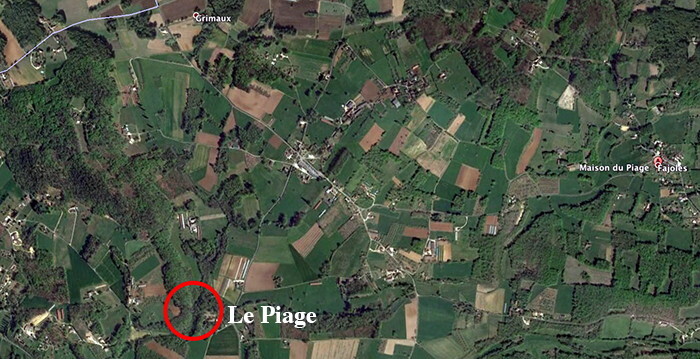 Location of le Piage, four kilometres from the small museum which celebrates it, Maison du Piage. The site of le Piage is at the foot of a limestone cliff. This image from Google Earth has been tilted to simulate an oblique aerial view. 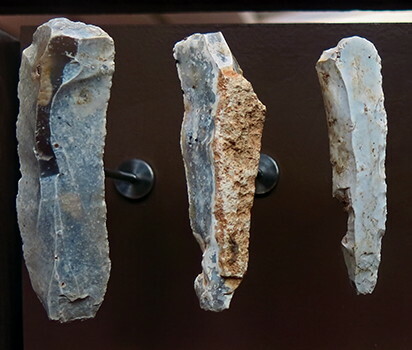 Protoaurignacian tools from le Piage layer K.
The Protoaurignacian technological signature is said to lie in the production of blades and bladelets within a single and continuous stone knapping sequence. Both products are thus obtained from the same core as the result of its progressive reduction. Blades are selected to manufacture end-scrapers, burins, and laterally-retouched tools. Slender blades, representing the intermediate products between blades and bladelets, are frequently left unretouched. 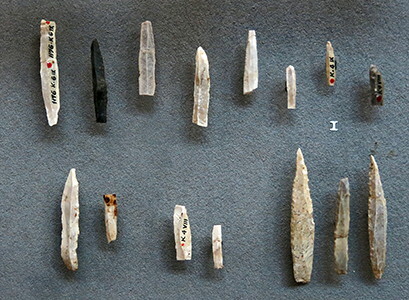 Bladelets are the dominant intention of the lithic production and are described as large, with rectilinear profiles, and are designated as Dufour sub-type Dufour. (centre left) Grattoir (scraper) and burin on an oblique truncation. (right) Point for a spear or dart. 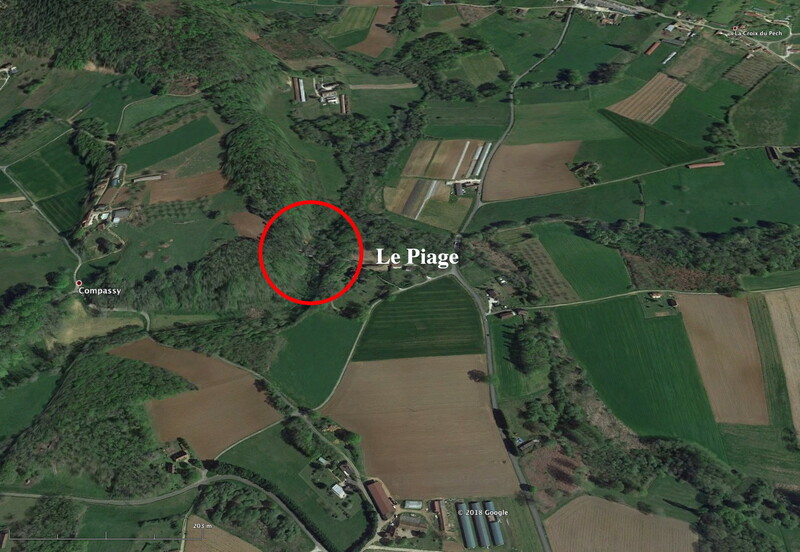 Le Piage served as the rear wall of several houses, and as storage, during Medieval times. We can see here the entry to the small storage room carved into the cliff wall high above ground level, as well as the holes made for beams of the roof and floors of the dwellings, as well as the rough masonry walls used to complete the rear wall of the houses where necessary. There are many such houses still in existence in the area, where the near vertical cliff completes the rear wall of the dwelling as well as providing support, often with a semi-horizontal channel carved into the limestone to accept tin or lead sheeting to provide flashing for the roof, and prevent leaks. Tools from le Piage layer GI. Grattoir made on a blade. A sample of Protoaurignacian tools from Fumane Cave, northern Italy. Burins on blade (1–6), end-scrapers on crested blades (7, 21), end-scrapers on flake (8, 13), thick end-scrapers on cortical flakes (9, 14), blades with lateral retouch (10–11, 17–19, 24), end-scraper on a technical flake with blade scars (12), thick blades with Aurignacian retouch (15, 16), end-scraper on a technical blade with bladelet scars (20), end-scraper on blade (22) belonging to the first reduction phase of core number 5 in Fig 2, end-scrapers with lateral scalar retouch on blades (23, 25). Arrows indicate the direction of the blow. Grotta di Fumane is a cave set on the southern edge of the Veneto Pre-Alps, in the North of Italy. 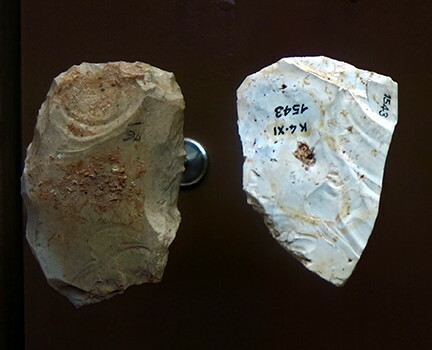 It has produced a dated sequence for the Middle to the Upper Palaeolithic. Excavations have been carried out at different times and at variable extents since 1988 beyond the present-day drip-line and in the cave entrance, an area where Middle and Upper Palaeolithic levels with well-preserved Mousterian and Aurignacian living-floors have been brought to light in a good state of preservation. Le Piage, topography of the site and its surrounds. (DAO F. Lacrampe, Archéosphère). Grattoirs (scrapers), with a burin at the top left and bottom right, and a point at the top right. 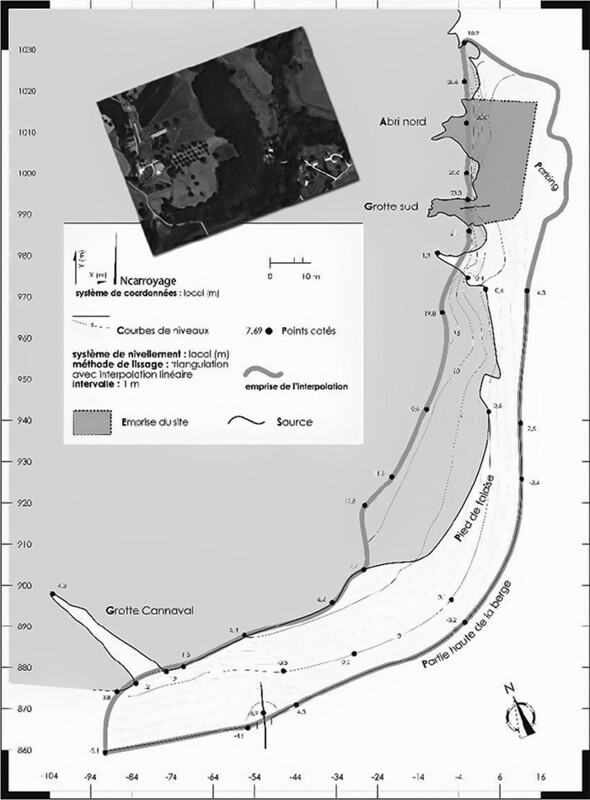 A detailed plan of le Piage, incorporating the campaigns of 2004 - 2006 and the different areas excavated. Compare with the simplified plan from 1981 below. Le Piage, plan of the excavated area and its surroundings, according to Champagne et Espitalié (1981), modified. Grid lines in bold: coupes as shown below. Source refers to water from a spring, a falaise is a cliff. Le Piage, the long vertical coupe shown on the plan above. Le Piage, the short vertical coupe shown on the plan above. B layer: Sterile screes, more or less modified, probably in the Middle Ages. CE layer, layers C-D-E: Solutrean and early Magdalenian. During the first excavation campaign, we discovered in the upper layers some Solutrean pieces and 'raclettes' (small, often round scrapers made on a flake). We thought there were two layers, C and E, with, if necessary, a sterile intermediate layer D. And, despite all the care taken in the excavations, it was not possible for us to separate these two levels. The layer is perfectly sealed and homogeneous throughout its thickness, the material used is the same and patina identical on all parts. 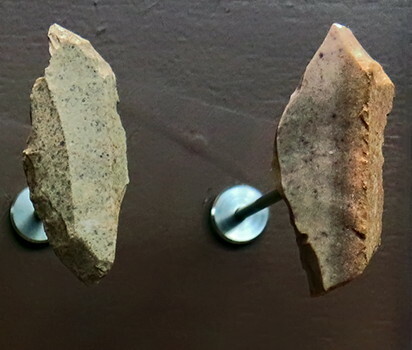 Lithic industry includes 955 tools including 12% certainly Solutrean elements, (shouldered points and laurel leaf points) but also an unusually high percentage, 19%, of raclettes. F layer: Aurignacian. 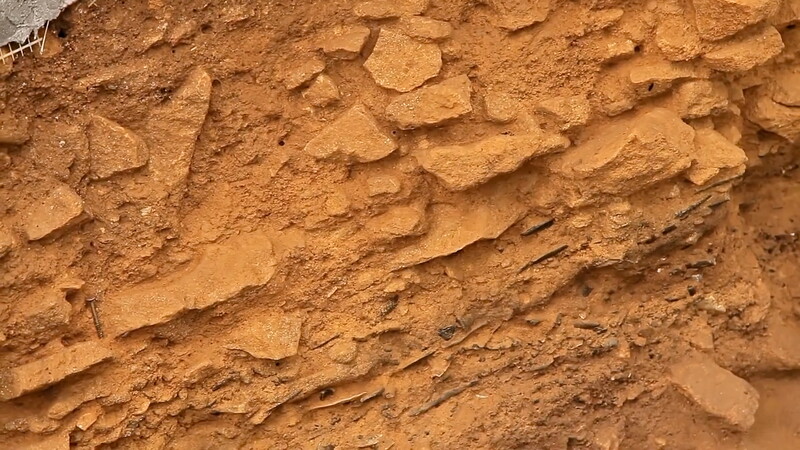 In this layer, the thickness of which reaches 130 cm at the foot of the cliff and covers the entire deposit, the 202 tools that make up the lithic material collected have been exposed sporadically, with no apparent localisation or traces of hearths. The whole is undeniably Aurignacian, with 57% of the lithic industry being scrapers; keeled scrapers are very rare (3.5%) and the burin index is even lower than in the underlying levels (1.5%). This level has provided us with two 'Dufour' small blades, a small amount, certainly, but necessary to mention since these lamellae were not to be found in layer K. It was at this period that a major rockfall of the cliff above occurred, as evidenced by the large blocks sealing the lower layers. F1 layer: Chatelperronian. This layer did not exist on the whole deposit; it appeared only in the northern part in the form of a bed of flakes at the base of layer F. It thickens rapidly to become a real layer of 15 cm thick which provided up to 2 300 flakes per square metre. 127 tools were collected, including 32 Chatelperronian tips, or 25%. It is therefore indisputable that we are in the presence, despite its stratigraphic position, of a Chatelperronian level. 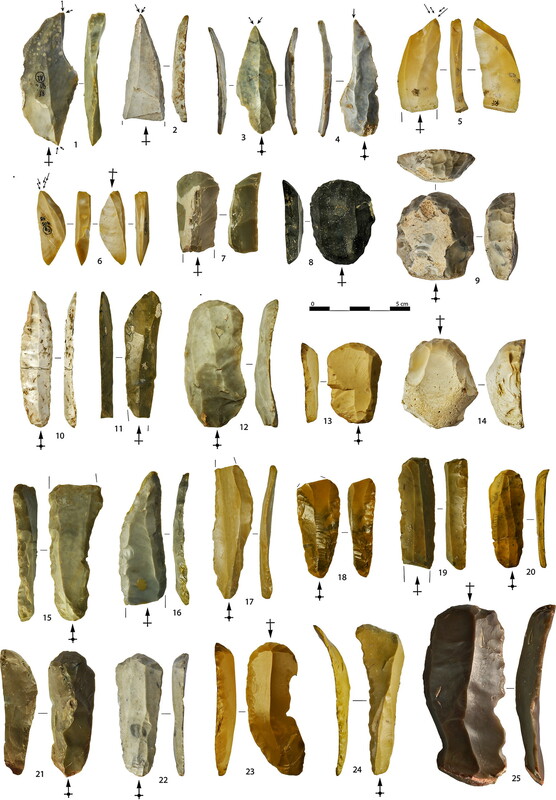 The rest of the lithic material includes scrapers (20%, some morphologically Aurignacian), rare burins (5%), but also mousteroid parts as in classical Chatelperronian deposits. 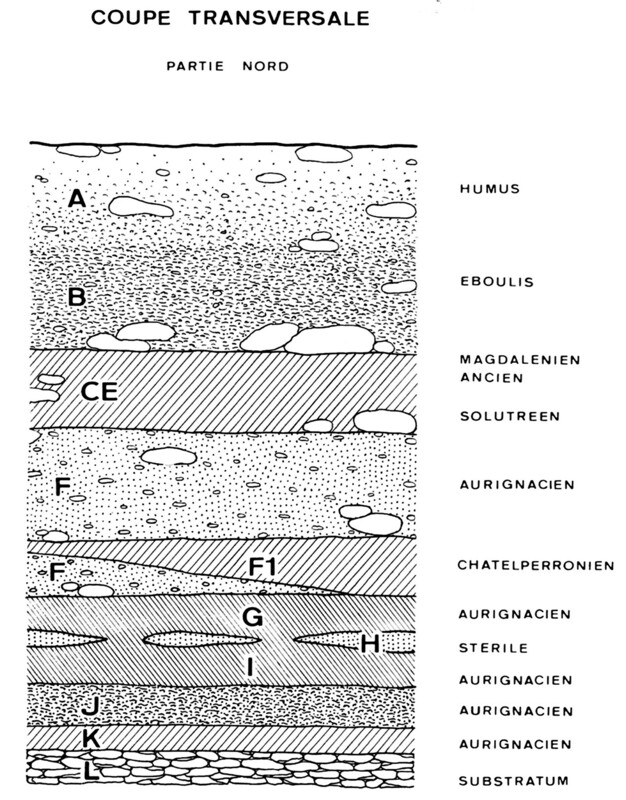 GI layer: Aurignacian. This is the most important layer of the deposit; it provided 2 019 tools. The variety of tools is identical to that of the underlying levels, but the quantitative difference is noticeable: there was an increase of the scraper index (to 56%), with a decrease of keeled scrapers and an increase of nosed scrapers. On the other hand, the burin index decreases sharply (to 2.8%). There was a total absence of backed blades and Dufour bladelets. 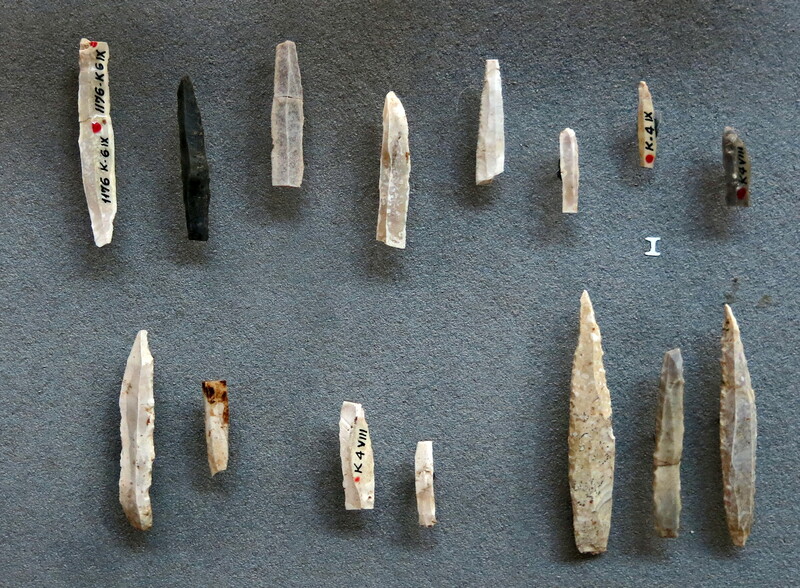 Bone material was always rare in this layer, but there were fragments of bone spearheads and awls. H layer: Lenses of yellow sand were included sporadically in the Aurignacian level, in the lower part of the deposit, and which forced us at the beginning of the excavations to break it down into two distinct strata of G and I, but which later proved to form only the one GI level. I layer: Aurignacian. This layer being only a subdivision, the finds were included with those of layer G and H, and renamed as Layer GI. J layer: Aurignacian. This layer is less rich than the previous one (only 381 tools). The variety of tools is identical to the GI layer, but is characterised by an increase in the scraper index (51%) and a stability of the burin index (18.9%), a stability that is only apparent because, if in the layer К 'Dufour' bladelets are excluded, the burin index increases to 21%. The fundamental difference between these two levels is the total disappearance of the 'Dufour' bladelets and backed bladelets. 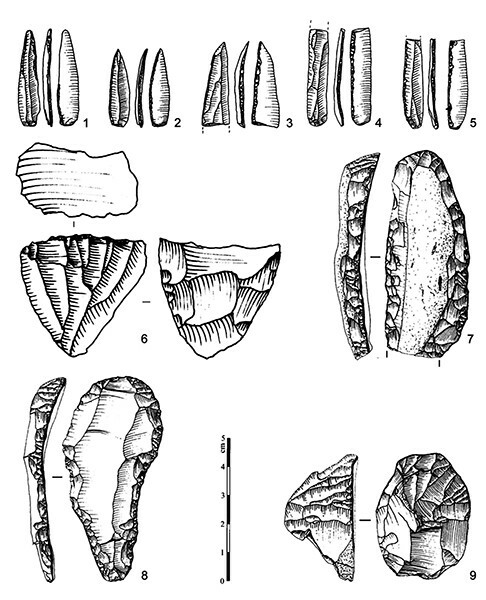 Bone material was still scarce (fragments of oval-section spearheads and an awl) with a definite absence of split base points. К layer: Aurignacian. This was a layer with a maximum thickness of 8 centimetres, and extending over the entire excavated area. It provided 581 lithic tools, broken down as follows: 30% scrapers (keeled scrapers, 2.7%, and nosed scrapers, 5.5%, are relatively scarce). Burins: 15% with a predominance of burins on a retouched truncation. Overall the debitage is more laminar than in the overlying layers where the blade index is very low. The most important fact is the presence in this Aurignacian level, the lowest one, of bladelets with inverse retouches of the 'Dufour' type. Their number stands at 148 and represents 25% of all tools. They are accompanied by ordinary backed bladelets but by also large straight blades, very sharp, with continuous retouches on both edges, identical to the points of the Font-Yves. 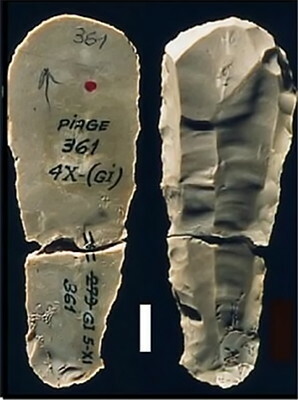 The (bone/antler) split-base point is absent and the bone material in general is rare, consisting only of fragments of circular-section spearheads and awls. (centre) Very long and skilfully made blade, heavily retouched, bearing a great resemblance in general shape to a pointe à cran, or shouldered point. Shouldered points did not make their appearance until much later, in the Gravettian, however. The tip has been modified to serve as a burin. 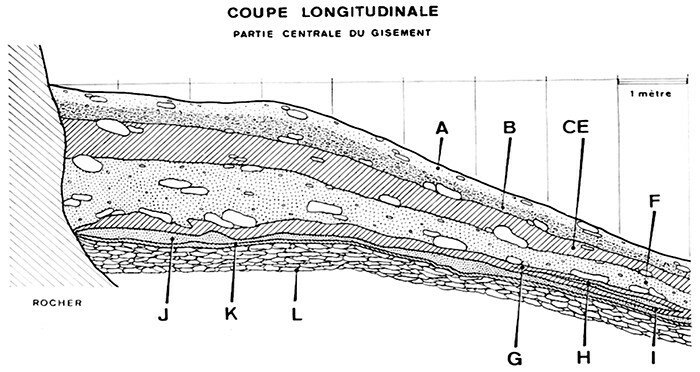 This is the first longitudinal coupe drawing produced by the excavators Champagne et Espitalié in 1967, published in a preliminary note in the Bulletin de la Société Préhistorique Française. The legend above provides the logic behind the naming of the layers, which is opaque in later scientific papers. This is the first transverse coupe drawing produced by the excavators Champagne et Espitalié in 1967, published in a preliminary note in the Bulletin de la Société Préhistorique Française. It is a useful additional tool to understand the layering at le Piage. Grattoir à museau, nosed end scraper. Grattoirs carénés, or keeled scrapers, also called carinated cores. 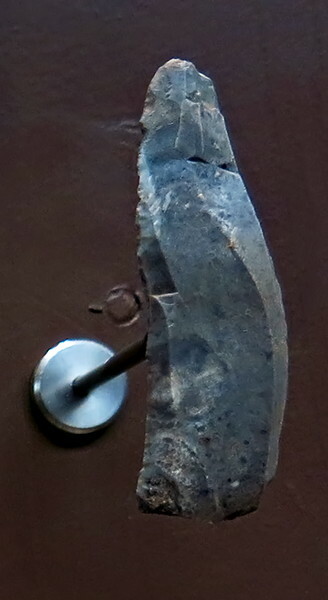 The centre keeled scraper appears to have been modified with a groove to serve as a smoother for spear or dart shafts. 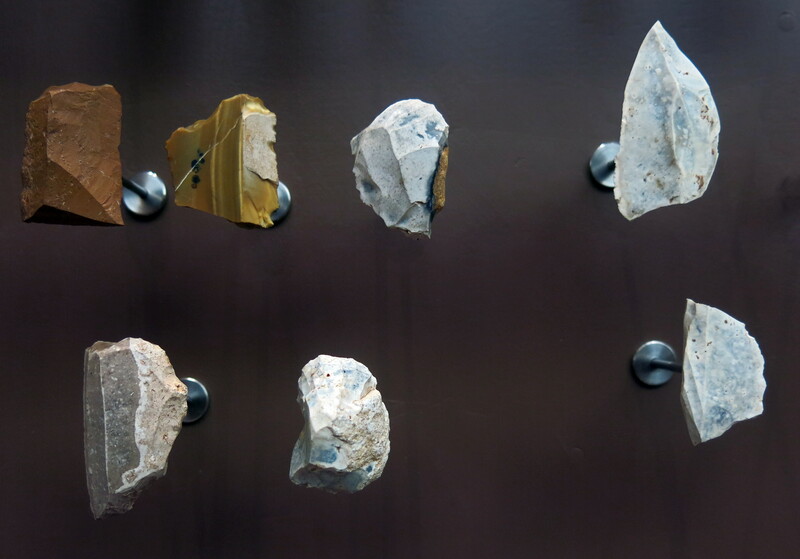 Dufour and backed bladelets, some of which may have served as projectile points. They represent 25% of all the tools from the K layer. The outer two points of the group of three at the bottom right of this image may be of the pseudo Font-Yves type, see below. Lithic industry from Krems-Hunddsteig, Austria. 1-5: retouched bladelets, Dufour type. 7-8: end-scrapers on retouched blades. 9: carinated core ('scraper') with a wide front. Note that pieces No. 1 to 6 can be fully integrated in the Protoaurignacian tradition, while No. 7 to 9 correspond more closely to the classic characteristics of the Early Aurignacian. 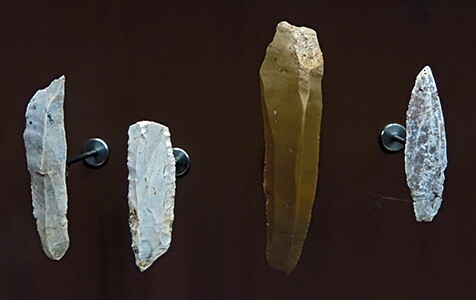 The Font-Yves point is classically considered as one of the main markers, with the large Dufour blade, of industries made by the earliest Aurignacian populations. The Font-Yves point is recognised in numerous deposits - or rather points with bilateral retouches interpreted as points of Font-Yves - and are mentioned over a vast territory. The distribution of these points extends from the Iberian Peninsula to Iran, where they are compared to Arjeneh peaks. In these deposits, it is associated with large Dufour blades with rectilinear tendency and constitutes one of the defining elements of the Protoaurignacian. However, these points have many differences with the eponymous pieces (No. 5 to 14 from le Piage). In the first place, the look and feel itself differs. These pieces are made on much less standardised media. The abrupt direct bilateral retouching aims at arranging an acute axial end. Points such as those from le Piage find no echo in the eponymous series. Beyond the functional aspects, the standard governing the development of these points differs. 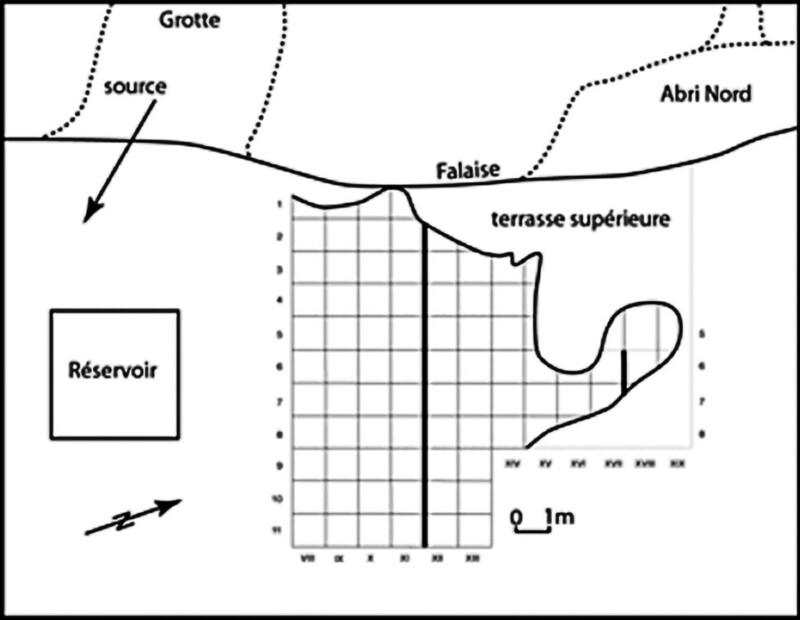 The current hypothesis for the genesis of the Aurignacian / Châtelperronian interstratification in the northern sector of the Piage deposit. A - Initial state of deposits prior to the establishment of unit 3. 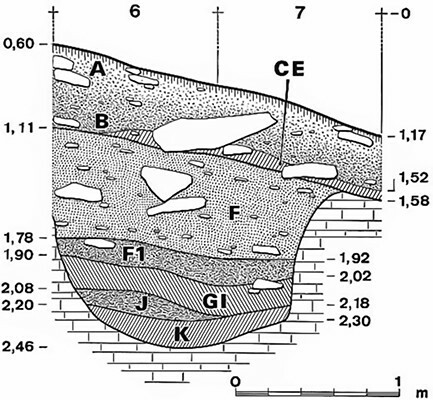 B - Lobe formation in sloping areas. 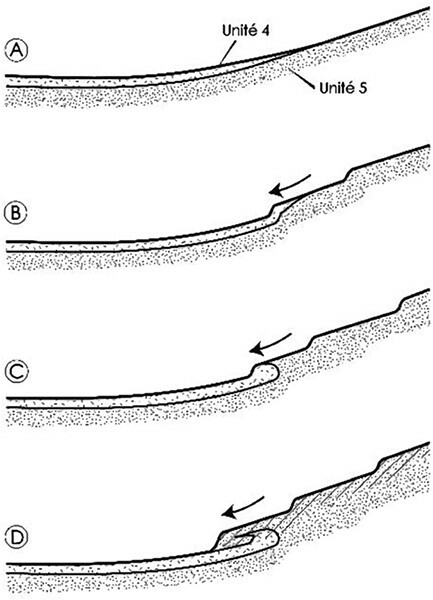 C - Progression of the lobes and deformations of the surface and subsurface levels. D - Creation of an interstratification by progression of the lobes. The hatching indicates the slice of deposit where the remains of the different layers are mixed, by cryoexpulsion, creeping and downhill movement of the lobes. Only the search of the North 'witness' deposits, left for posterity for future examination, will verify this hypothesis. (left) Grattoirs (scrapers) on flakes. (right) Burins, with a burin spall type on the left, and a dihedral burin on the right. Le Piage, 2005, view of the north 'witness' deposits from the North shelter. The dotted arrows show the channels that open from the foot of the latter. Their existence could largely have affected the deposits excavated by F. Champagne and R. Espitalié. 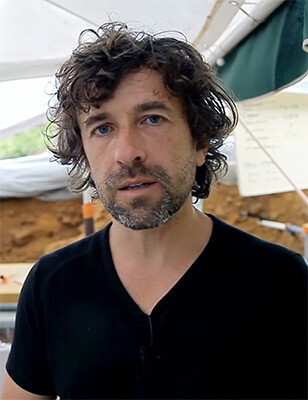 Jean-Guillaume Bordes (Université de Bordeaux) has, since circa 2000, been conducting research (amongst other academic projects) on the deposits at le Piage. This year, what will the excavations be about? The subject does not vary. Every year, we advance very slowly. We are working on the traces of a camp from 35 000 years ago. We take the coordinates of many objects: flint, bones ... We must take our time: we advance 10 cm per year. What did you discover on this site? 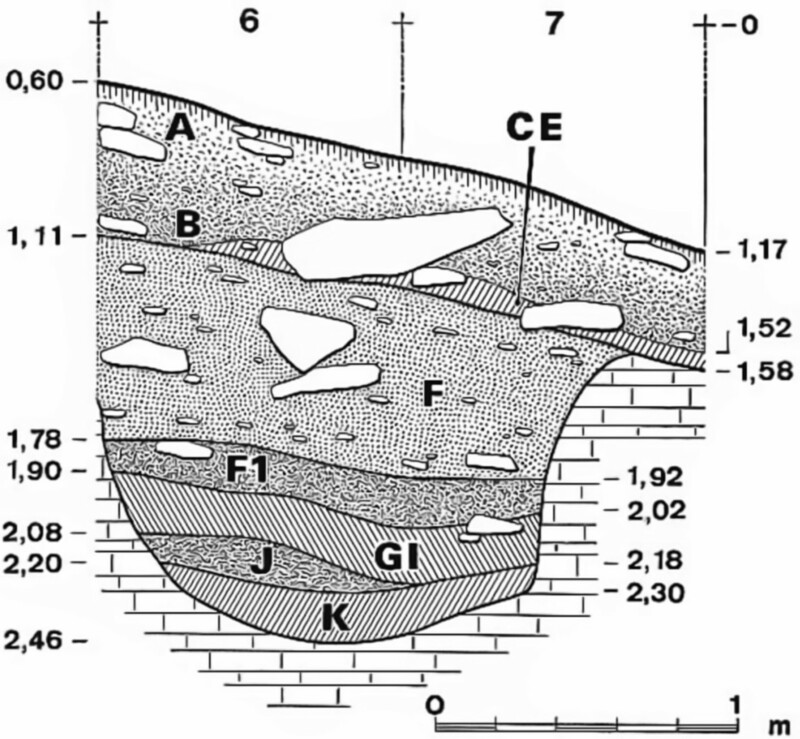 There are layers of a period that we call the Proto-Aurignacian. This is the period between the end of Neanderthals and the beginning of modern men. A little known period. Piage is an important site? It has been known since the 1970s. It is the only site in the world that has delivered artefacts and evidence of human activity for such a long period of 30 000 years. It is world famous, and every year we have researchers come here from all over the world. We have a team of volunteers: students or enthusiasts. We work on the site from May 30 to June 30. We use dentistry and archeology tools. We will need another ten years of research. Only a very small part of the site is excavated to leave to future generations: the questions will evolve just like the methods of excavations. They will need additional information. What does the Piage Museum represent? Excavations are conducted under the auspices of the Archeology Department of the Ministry of Culture. But locally, we are supported by an association, Friends of le Piaget, which has set up a small museum. It publicises and displays the discoveries at the site. In Fajoles, we have been very lucky to have committed, enthusiastic local people supported by local government, like nowhere else. The dig in progress, with students and volunteers helping with the excavation. Note the plaster on the top of the coupe, as well as a tarpaulin, used to protect the dig face from erosion. In order to create as little damage as possible, the region of the dig has had a strong and well made support installed, which has the advantage of easy access to the face of the excavation, with cantilevered walkways which can be used, as here, as a way to lie down horizontally, both relieving discomfort, allowing very good access, and protecting the coupe and surrounds from damage. At the bottom left can be seen a 'north' arrow and a black and white centimetres scale to aid with interpreting photographs. This photograph shows a closeup of the coupe, with a thick sterile layer overlying a layer containing flint tools and debitage. 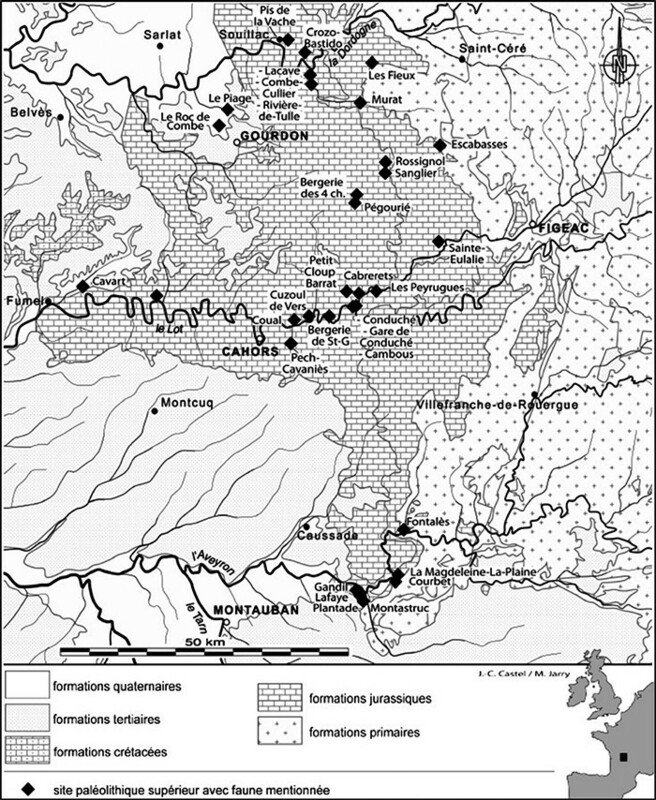 Distribution of the Upper Palaeolithic sites from the Quercy region in which faunal material is partially preserved, showing the location of le Piage and le Roc de Combe. 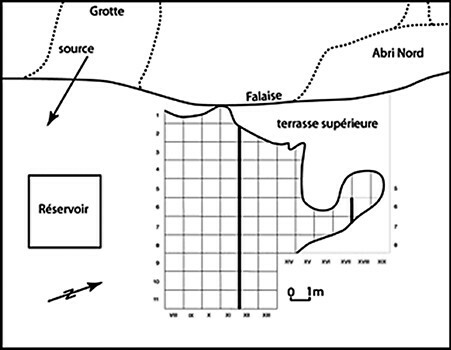 Bordes, J-G., 2002: Les interstratifications Châtelperronien / Aurignacien du Roc-de-Combe et du Piage (Lot, France). Analyse taphonomique des industries lithiques; implications archéologiques, Université Bordeaux I, Université Sciences et Technologies - Bordeaux I, 2002. Français. Champagne F., Espitalié R., 1967: La stratigraphie du Piage: note préliminaire, Bulletin de la Société Préhistorique Française, vol.64, études et travaux n°1:29-34. Champagne F., Espitalié R., 1981: Le Piage, site préhistorique du Lot, Mémoires de la Société Préhistorique Française, 15, 205 p.
Heinzelin de Breaucourt J., 1962: Manuel de typologie des industries lithiques, Bruxelles, 74 p.
Pesesse, D., 2006: La pointe de Font-Yves et les productions lithiques des derniers Aurignaciens, PALEO, 21 | 2011, 203-222. Sonneville Bordes, D., Perrot J., 1956: Lexique typologique du Paléolithique supérieur. Outillage lithique, Bulletin de la Société Préhistorique Française, t. 53, 1956, p. 547-559.